London (AFP) - Veteran Lightning Spear finally won a Group One race on Wednesday, after finishing in the first three on six previous occasions, when he landed the Sussex Stakes at Glorious Goodwood. 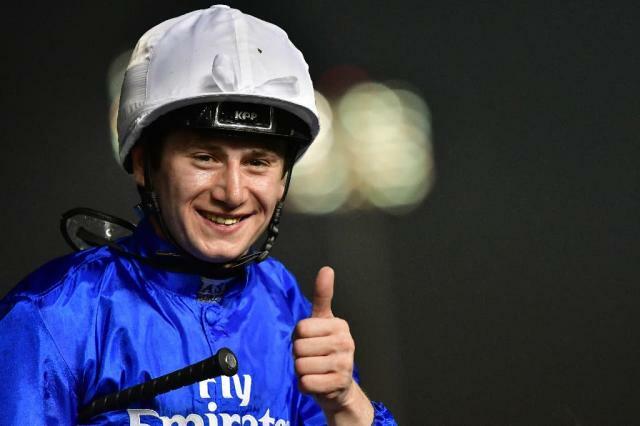 The seven-year-old -- trained by David Simcock -- was delivered with precision timing by Oisin Murphy to pass Expert Eye and take the honours and the winner's cheque of £593,000 ($778,000, 600,000 euros) for owners Qatar Racing Limited. In a race that lacked pace, it was left to unbeaten favourite Without Parole to lead but while he battled gamely for much of the finishing straight he faded to finish second last. Murphy, who collected his first English Group One success only last month with Roaring Lion in the Eclipse Stakes, said he had battled nerves prior to the off. "I never ever get nervous before the big races like the Derby and poke fun at the other jockeys," said Murphy. "However, I think I was nervous this time because I felt I had left behind a Group One with this horse earlier in the season (the Lockinge Stakes at Newbury) and I owed the team one. "But what a horse! He deserved it and at seven years of age," added Murphy. Simcock's wife Jenny was in tears after seeing Lightning Spear finally end his Group One jinx. "Six Group Ones he threatened to win but never quite came off and at last today he has won one," said Simcock. "We always knew from his work on the gallops that he was Group One standard but it was just a case of him reproducing that form on the track. "He finally clicked today and above all I am really pleased for the horse." The Molecomb Stakes, the day's other Group One race, went to the Richard Spencer-trained Rumble Inthejungle, repeating the feat of his sire (father) Bungle Inthejungle six years ago. Tom Queally had the race wrapped up with a furlong (200 metres) to go and finished clear of Life of Riley and the favourite Soldier's Call. Queally, who had higher-profile success on the same track in successive Sussex Stakes in 2011 and 2012 with the legendary unbeaten Frankel, said his winner has great potential. "Excellent run but he has always been a pretty good horse," said Queally. "He is not short of gears and a child could have ridden him," added the 33-year-old Irishman.